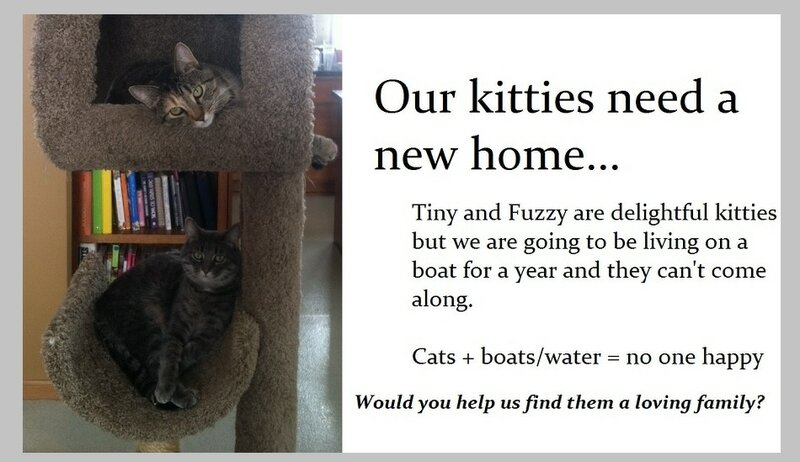 ​Starting this September we are going to be living on a boat for one year and the kitties can't go with us and that is the only reason we are looking for a new home for them. They are female siblings that we adopted about 2 years ago. They were rescues that a foster family had before they came to us. The foster mom bottle fed them so they are real "people" cats. They have been neutered and are up to date on shots. They just had a check-up at Lake Vet Clinic. They have never missed the litter box! They eat Meow Mix and nothing else. They have a variety of scratching posts that they use a lot so they haven't scratched the furniture. We live in the country so they like to go outside in nice weather but don't sleep outside at night. They definitely aren't interested in being outside in the cold! They love sitting on laps. Or being where people are gathering. When company comes they line up to get petted. When we are gone on vacation the little neighbor girls come over to play with them, feed them and poop scoop. They love the girls. They haven't been around small children who would grab them so maybe not good for families with toddlers. They haven't been around dogs either. TINY- She was the runt of the litter but has grown to a healthy size cat. She is tabby striped with some tri-color orange on her face. She is all about being in the action. FUZZY- She is more of silver color and as soft as a rabbit. Since she has longer hair I brush her in the spring to control her shedding. She loves watching bugs, leaves, sun beams and is great at sleeping. ​If you are a cat lover you probably already have a kitty. BUT if you would help us spread the word to other cat lovers I'm sure we can find the perfect home for these warm and fuzzy friends. There must be someone our there who would like to skip the litter box training, don't shred the furniture, climb the drapes phase and just enjoy some happy kitties. We are working with Almost Home in Madison to facilitate the adoption. You can contact them through their Facebook page. The kitties have equipment/supplies that we would be happy to send with them when they move to their new home. We thought these things would make the girls feel more comfortable and save their new family some money.